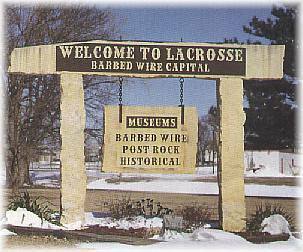 LaCrosse is known throughout the nation as the 'Barbed Wire Capital of the World' and hosts the Annual Barbed Wire Convention every spring. The Barbed Wire Museum, The Post Rock Museum, The Rush County Historical Museum, and a plaque honoring Howard R. Barnard (1863-1948), pioneer educator, founder of consolidated schools, and the school bus system, are located in Grass Park (the old Varney homestead) at the south side of town. "LaCrosse was filed in 1876 as an original town site by the Missouri-Pacific Railroad when Rush County was re-surveyed two years after it was organized, making this location the exact center of the county. The land belonged to patentee and surveyor, Denman A. Stubbs, and wife, Ellen Jewell Stubbs, who came from Wisconsin and settled in 1874. These early settlers were the first developers of LaCrosse. Lots in the town were soon sold to young men, mostly members of the Society of Friends, from Pennsylvania, New York, New Jersey, Ohio, Illinois, Wisconsin, and Eastern Kansas. The county offices were moved to LaCrosse from Rush Center in 1876, much to the dismay of Rush Center's citizens, and (usually) occupied the second story of a stone building on the west side of Main Street, with the court in a small frame building next door. The present court house was built in 1888 and became the permanent home of the county offices. This building is now listed on the National Register of Historic Buildings. The first LaCrosse school was erected in 1877. The earliest churches in LaCrosse were The United Brethren Church, first known as The LaCrosse Meeting of The Society of Friends, established in 1877; The Christian Church, established in 1887; and The Methodist Church. Rush County has 22,313 acres of walk-in hunting.